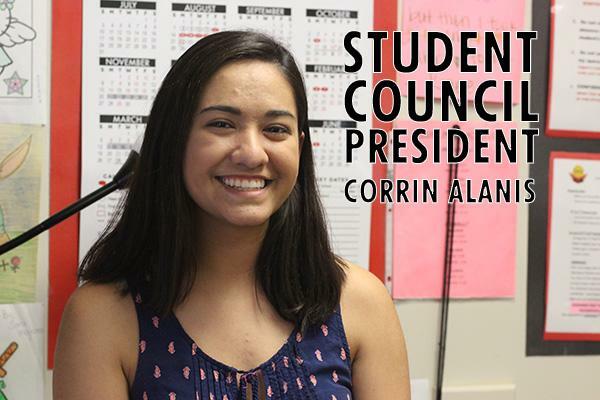 Last year, senior Corrin Alanis ran in the Student Council presidential campaign against senior Carlos Fernandez. With the right amount of motivation and a flyer that read “I don’t run often, but when I do, I run for Student Council President,” Alanis was victorious. “It was cool getting to see all of my friends being super supportive about what I was doing and getting the energy up around school,” Alanis said. Having gained ⅓ of the vote from the student population, ⅓ of the vote from the teacher faculty and ⅓ of the vote from last year’s president, Nicholas Kuehl, Alanis emerged from the student body as the 2016-2017 Student Council President. “I feel like I am held to a higher standard now and forced to take responsibility when there are things that need to be done or just different situations around school where I must step up,” Alanis said. She elaborates on the impact of student participation not only in Student Council but other extracurricular activities and clubs offered at school. Besides altering the tradition of having music during passing period on Fridays and making it a daily occurrence, Alanis and her fellow Student Council officers are strengthening another tradition known as the gift exchange which seeks to form friendly ties with other high schools in District 25-6A. Twenty minutes before every football game, the student councils of the competing high schools meet at the 50 yard line to exchange gifts and wish the other team the best of luck in their school year and football season. For Alanis, having students participate in Student Council is key to accomplishing its mission statement and goals. Student Council meets every Tuesday until Homecoming (Sept. 24) and after this date, Wednesdays during Ranger Time.